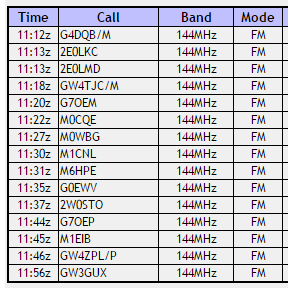 M0PLA/P SOTA Activations: 20th May 2017. GW/NW-039 SOTA Activation visit. 20th May 2017. GW/NW-039 SOTA Activation visit. Grid SH 953423. Altitude 611M. This weekend saw our first visit to Foel Goch situated around 4 1/2 miles to the North East of Bala. We left home at 08:10 a.m. and headed towards Wales on the A5. We reached Grid SH 97616 45565 and followed the sign post to Llangwm, then followed on until we reached Grid SH 96259 43502 where we parked the car at around 10:10 a.m. The ascent took around 40 minutes and was not too bad except the driving rain. When we arrived we set up a wind/rain break with our tarpaulin as seen in the photo's below. Once the radio was set up Jamie started his usual job of cooking our infamous bacon and black pudding roll's. They went down a treat. The QSO's came in fast and within 6 minutes we had qualified the summit, we carried on and logged 15 contacts in just over 40 minutes with a few minutes break for food. This was our first SOTA activation for 5 weeks so we decided only to set up 2M with a new dipole that I had built last week and it seamed to do its job very well. 27th May 2017. GW/NW-040 SOTA Activation visit.